If you like Pinterest, check this out — we have a new board on our Pinterest page celebrating all things summer around Asheville. We’ll be adding to our Summertime near Asheville board all summer long! 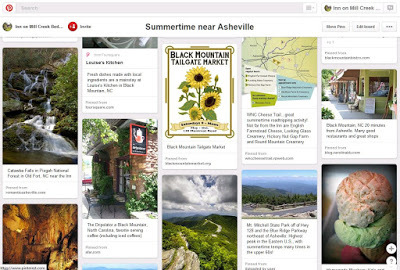 Pinterest is a great resource to use for lots of things, including trip planning, and we hope this board is helpful for our guests as they plan their summertime excursion to the North Carolina mountains. And, of course, we’ll be rolling out our fall season board soon! This entry was posted in Pinterest and tagged Asheville, Pinterest, Summer by Inn on Mill Creek. Bookmark the permalink.